As you no doubt seen online, there will be a meeting next week on how to deal handle General Leia’s role in Episode IX with the passing of actress Carrie Fisher on December 27th. Everybody has an opinion, and so do I. But let’s look at this logically, realistically, and do what’s best. Given what information has come out, Leia has a bigger role in Episode VIII and presumably in Episode IX. Two scenes have been mentioned: the reunion with her brother Luke (played by Mark Hamill), and a confrontation with her son Ben/Kylo Ren (played by Adam Driver). One would assume that former will be seen in the next film, leaving the latter to be in the final installment of this trilogy. 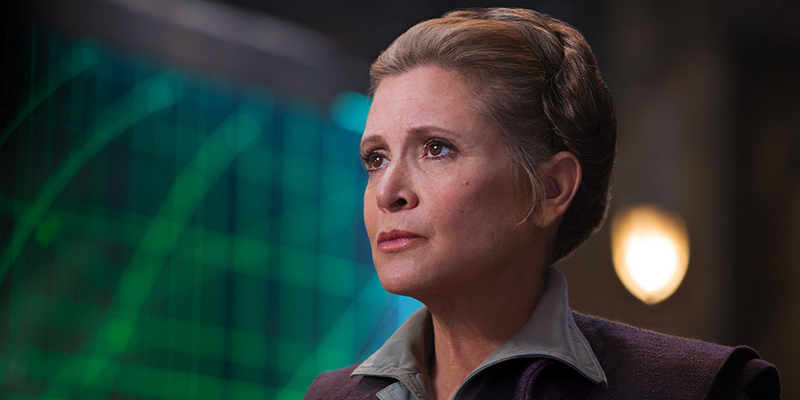 CGI – hire an actress to be on set and then CGI Leia’s face on for the final product. This simply will not work. While CGI has come a long way, we aren’t there when it comes to this. Just look at the criticisms of the young Leia in ROGUE ONE. Plus, I’m not sure how Carrie would feel about it. She joked about Lucasfilm owning her likeness to the point of owing George a couple of bucks every time she looked in the mirror. I think she wouldn’t approve, but what do I know. She’s gone into hiding or she’s on a secret mission - NO. This is not very Leia-ish (forgive the new word there). If THE FORCE AWAKENS proved anything, it showed the Leia won’t run away when she knows she is needed to fight the good fight. I think fans would not approve of this…neither would Carrie. She dies off-screen – Again no. This is a disservice to the character. One of the things that really got me upset with the prequels was the handling of Padme Amidala. She was a strong, natural leader and a fighter in the first two films, then noting more than being there to give birth to the twins and….lose the will to live? WHAT? It made no sense. Killing Leia off-screen will be the same thing. Replace Carrie with another actress – while I’m not happy with this, it’s the best solution. Leia deserves to be there at the end of this trilogy. This is it (more than likely) for the classic gang, with the kids taking over on Episode X (assuming there is one). Will this new actress be accepted? Yes and no. It would help if she had the approval and blessings of Carrie’s daughter Billie Lourd and the Fisher family. I don’t envy the decision that Lucasfilm has ahead of them. All I ask is that they honor the Princess that has become an icon for so many people, and the incredible woman that brought her to life. Rest in Peace, Carrie. We love you and will miss you.